As a result of the composition of goat milk butter the product has a lower melting point than regular butter, making it easy spreadable and ideally suited to applications such as the production of ice-cream! Goat milk butter does not contain carotene, so the product possesses a clear, white color. Goat milk butter is suitable for use in a wide range of applications, such as in the ice-cream, cosmetics and flavoring industries; and in the catering industry, as an ingredient in sauces, but also to fry meat. Creating butter from your fresh goat milk is more nutritious for you than store bought butter because there are no preservatives. It is also just plain fun. With this method, you will be able to make butter quickly. No need for slow butter churns. Goat milk is naturally homogenized, unlike cow milk, so you will need a cream separator and separate the cream from the milk. Pour the cream into your blender. Only fill 3/4 full. Add butter coloring or yellow food coloring if desired. Goat milk butter will be a clean, white color in it’s natural state. Place top on blender and begin blending your cream with short bursts of speed. On/off for a few seconds at a time. The butter will form quickly. Pour excess liquid out of the blender. Remove butter from blender and place into a colander and rinse with very cold water. Put your rinsed butter onto a cutting board. Add 1/2 tsp per pound of butter (or to taste). Mix the salt into the butter with a spatula. Keep removing excess liquid. May help to have a towel underneath your cutting board to absorb any possible mess. Keep working the butter so you can remove as much liquid as possible. Place butter in a mold of your choice. Purchased molds are a lot of fun but you can also improvise and use things you may already have on hand. You can even use a glass square cake pan and then cut bars from it after it cools. 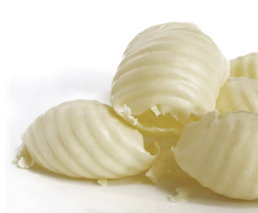 Wrap molded butter up in plastic wrap and store in refrigerator for up to 2 weeks or freeze.